Last week we explained how money transfers work between two accounts held with the same bank (intra-bank transfers), as well as transfers between two different banks (inter-bank transfers). In case you missed that post, we recommend going back and reading it before you move on - it will help you understand the world of SWIFT and SEPA transfers. International money transfers are basically inter-bank transfers, only in this case, the two banks happen to be in different countries, which makes things slightly more complex. The principle of correspondent banking still applies, which means that the two banks need to have an established relationship in order to facilitate the transfer. 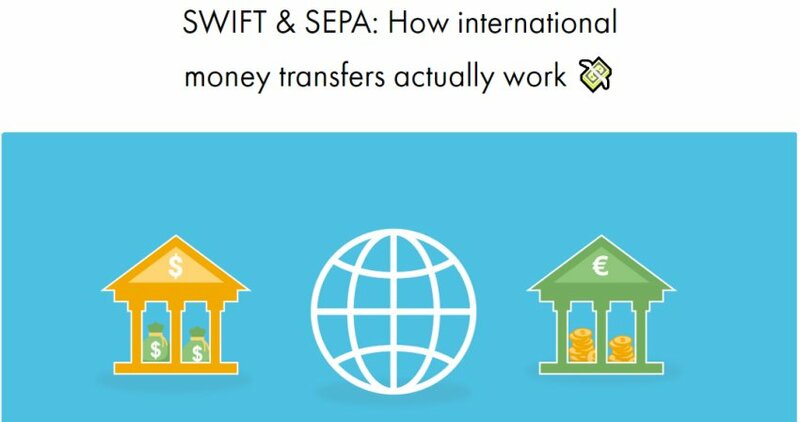 The two most common ways to transfer money internationally are known as a SWIFT and a SEPA transfer. The Society of Worldwide Interbank Financial Telecommunication or SWIFT is a financial messaging system that runs on a network of tens of thousands of financial institutions from around the world. The SWIFT system enables these institutions to securely send and receive information on financial transactions in a standardized way. This ultimately allows money to be sent from one bank to another, virtually anywhere in the world and in many different currencies. But this system is far from perfect. SWIFT does not actually send money, it simply sends messages between the banks. Because of this, other systems that require more human intervention must be used to transfer the actual funds and this, in turn, makes SWIFT transfers slow. What’s more, the complex nature of these transfers usually incur a fee which nearly always gets passed on to consumers. Since the banks have a direct relationship, they are able to easily moves the funds across, which keeps fees to a minimum and makes the transfer happen quickly. If the banks don’t have a direct relationship, one or more intermediary banks must be found to facilitate the transfer. In many ways, a SEPA transfer is similar to a domestic transfer. In essence, banks that support SEPA transfers either have direct relationships established or a network of intermediary banks, thus allowing transfers to run across country borders. There is actually more that goes on behind the scenes, but for the purpose of this article, we won’t go into more details. Some banks will still charge a fee for making or receiving a SEPA transfer. Please check with your bank before making a SEPA transfer to or from your Revolut account.